Drinks and desserts are both pretty great on their own. And together, they’re even better. With that in mind — a booze-infused cupcake line — in Washington, DC. We asked her for her tips on nailing the baking + booze combo, plus four original dessert recipes that you can easily replicate in your own kitchen. And it often works best when the alcohol you’re adding mirrors an ingredient that’s already in the recipe. 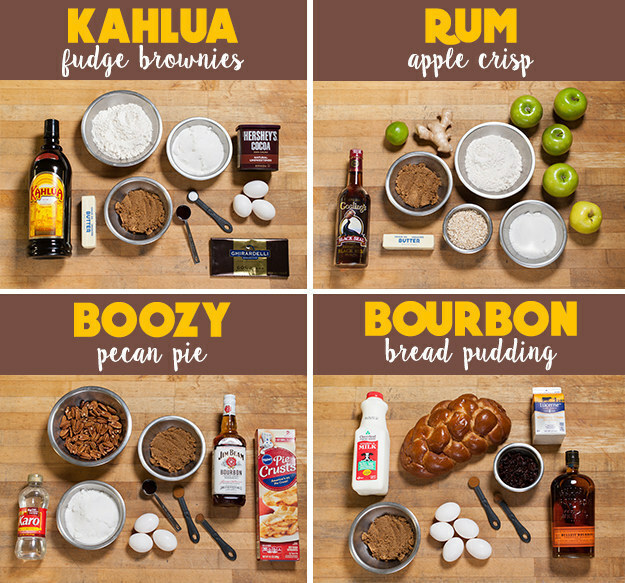 For example: Tossing a coffee-flavored liqueur, like Kahlua, into chocolate or coffee cake. Or adding a sweeter whiskey, like William Wolf, to pecan pie. It’s usually a safe bet to say that if you like a certain liquor in a drink, you’ll like it in a dessert. But still, ratio is key. Thick, custard-y desserts — like bourbon bread pudding— can handle more liquor because of its breaded base, said Sleeper. Lighter, fruit-based options — like a rum apple crisp — typically need less. 3. You don’t need fancy equipment to make the recipes below, and there’s no shame in kitchen shortcuts. “I always hear people say, ‘I can cook but I can’t bake,’ but these recipes are super simple,” said Sleeper. (Plus, there are ways to make every recipe easier, like swapping in store-bought pie crust.) And while it’s true that there’s somewhat of an ~art~ to baking, it’s also true that you shouldn’t be intimidated by the process. You should always experiment in the kitchen — and these starter desserts will let you do just that.